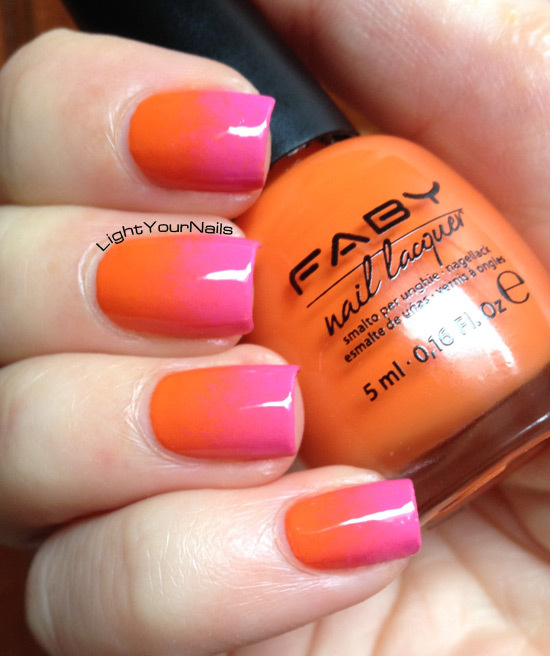 Faby Keep on the Sunny Side and gradient | Light Your Nails! I am back with another fabulous Faby from the Music collection. I’ve already told you some facts about Faby company and its Music collection where all nail polish shades are inspired by music genres. Today we have Faby Keep on the Sunny Side, which is a bright tangerine orange inspired by country music. It’s actually named after a popular country balled from the 20’s. I must say I was quite scared by this nail polish as I thought it would be patchy and draggy but nope! I was so wrong! Faby once again delivered a great quality product. The formula is not thick nor watery, just the perfect consistency and it applied like butter. In the pics you see two coats without top coat. Whether or not you like orange on your nails you can easily see this is a flawless one! Oggi vi parlo di un altro degli smalti Faby della collezione Music. Vi ho già parlato dell’azienda Faby e di questa collezione Music, dove ogni smalto è ispirato a un genere musicale. Oggi vi mostro Faby Keep on the Sunny Side, che è un arancione mandarino ispirato alla musica country. Il nome in realtà è proprio quello di una canzone country molto popolare negli anni ‘20. Devo dire che avevo un po’ paura che questo colore mi desse dei problemi, e invece no! Faby ancora una volta si è dimostrata sinonimo di qualità. La consistenza di questo smalto non è nè troppo liquida nè densa, il giusto compromesso. La stesura è stata come burro. In foto vedete due passate senza top coat, e che vi piaccia o no l’arancione sulle unghie non potete non vedere che questo smalto si è steso senza difetti! I quite like bright oranges on my nails honestly and I wore it happily for a few days. Then I decided to spice it up a little with a gradient. I matched it to Faby Dedicated to Brigitte, another shade from Faby Music collection which was inspired by pop music. I’ve already showed you that one >here<. A me gli arancioni molto vivaci piacciono sulle unghie e sono stata ben contenta di indossarlo per qualche giorno. Poi però ho deciso di dargli nuova vita creando una sfumatura con Faby Dedicated to Brigitte, l’altro smalto della collezione Faby Music che vi ho già fatto vedere in >questo post< e che è ispirato alla musica pop. Once again I am super impressed by Faby: their Nail Review treatment is my current favourite base coat together with Duri Rejuvacote, and both Faby Music nail polishes I own are just perfect. Did you like my country and pop music combo? I loved it! Too bad the weather wasn’t good that day! Ancora una volta sono piacevolmente impressionata da Faby: entrambi gli smalti che ho provato sono perfetti, e il loro trattamente unghie Nail Renew è il mio preferito del momento assieme allo storico Duri Rejuvacote. Vi piace la mia combinazione di pop e country? Io l’ho adorata, peccato per il tempo grigio quando ho scattato le foto! Uhm, un bellissimo punto di arancio! E poi arancio+rosa acceso è una delle mie combo preferite per la gradient. Awee you are so sweet, thank you! Bello lo smalto, ma ancora più bello questo gradient! Non ti è venuta voglia di farci un bello stamping sopra? Secondo me sarebbe stata la ciliegina sulla torta! It's a burnt orange somehow, very interesting shade; lovely gradient. ...bellissimo colore vitaminico!! !...io è da tempo che sostengo che gli smalti faby sono ottimi...fra i miei preferiti!!! E avevi più che ragione Luisa! Perfect bright polish for summer! Love the gradient you did too! Il gradiente è davvero stupendo! La qualità degli smalti Fabi è sorprendente! Grazie Marghe! Hai ragione, davvero una qualità superiore! That gradient is pure perfection! OH that gradient! Such a tropical combination! My mind is trying to send me a message maybe?? This is so juicy and gorgeous, I just love it! I LOVE orange nails! But of course I am a Dutchie, so I am kinda born with a love for orange, lol ;) And paired with the pink it is super summery and a little retro, I looooove it! I really love the gradient, such a summer lush combo. So pretty. That gradient is gorgeous!! Perfect colors together! That polish looks amazing on you!! Thank you! I am so pale skinned that brights hardly ever fail on me! Now that's a bright orange, and so true to the color. I really like it combined with Bridget in the gradient. Your gradient is so perfect!! That gradient is perfection! I adore that orange on its own too! Anche io ho un soft spot per questi arancioni putenti, questo sembra davvero fantastico! Fantastic gradient! The colors are so saturated and rich!